Your teenager is getting braces for the first time and you have questions. Depending on what kind of orthodontic treatment you decide on, your son or daughter’s experience will vary. After being examined by an orthodontist, your teen will be recommended for the treatment that best addresses their specific dental needs. Read more to learn our tips for getting braces for teens, no matter what orthodontic approach you choose! Discuss teeth straightening options with your teen. We advise parents to wait until a visit to the orthodontist before you begin discussing options. After your son or daughter has been examined and recommendations are made, you will have the opportunity to ask questions. We realize that each patient has different priorities, so don’t be afraid to ask about what matters to you. 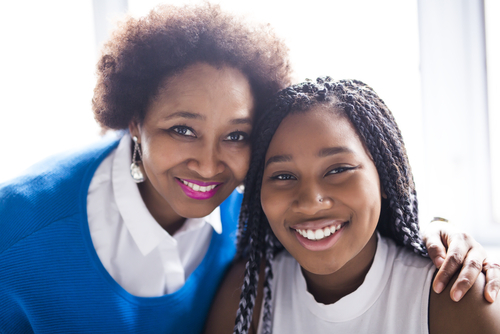 Once it’s clear what your options are (this could include traditional braces, ceramic braces, Invisalign, or lingual braces), take the time to ask your son or daughter how they feel and find out what’s important to them. For example, having invisible or clear braces can be high on the list for teens who feel particularly self-conscious, but other teens may enjoy sporting colorful bands with traditional braces. Prepare your teen for the pros and cons of the chosen treatment. Each orthodontic treatment has its advantages and disadvantages. You can help your teen to have a realistic idea of what to expect before proceeding by asking questions and comparing treatments. Be sure to explain that many of the challenging aspects of orthodontia are common to all treatments. For example, traditional braces may cause irritation to the gums due to their metal parts, but the same can occur with Invisalign when the edges of the aligners rub against the gums. For this problem, you should stock up on orthodontic wax (also known as dental wax/braces wax). Simply roll it along the fingertips to soften it and then place it on the part of the bracket or aligner that is causing the problem. The wax will act as a protective layer between the appliance and your teen’s gums. Remind your teen that the benefits far outweigh the challenges. Sometimes the sacrifices of orthodontic treatment can seem overwhelming for a teenager, but the truth is that for most patients they entail minor lifestyle adjustments. Traditional and lingual braces require certain dietary restrictions, while Invisalign may inhibit long coffee-sipping sessions because aligners must be removed during eating and drinking, and they must remain in the mouth for 22-24 hours daily to be effective. Even when you consider these discomforts, your teen stands a far better chance of avoiding pain in the future by getting orthodontic treatment now. Crooked and misaligned teeth are particularly vulnerable to gum disease, tooth loss, and abscess (which can require a root canal). Orthodontic treatment is an investment that will greatly reduce your teen’s risk of experiencing these unpleasant and often costly conditions. And, of course, an aesthetically-pleasing smile will help to put your son or daughter on a path to confident future! We hope that these tips for getting braces will help your son or daughter to feel informed and prepared as he or she begins treatment. With the many options available in orthodontics today, we’re confident that we can help you find the right approach for your teen. If you’re looking for affordable deals for orthodontic treatment, you should consider receiving care at Penn Dental Medicine. As a dental school, we offer discounted prices on all treatments, making it possible for many families in the area to make this important investment for their daughter or son. At Penn Dental Medicine, getting a good price doesn’t affect the quality you receive. PDM is an institutional leader in dentistry and renowned for the quality of care we provide our patients. To schedule your teen’s orthodontic consultation with us, please call our offices at 215-898-8965 or fill out this contact form today.